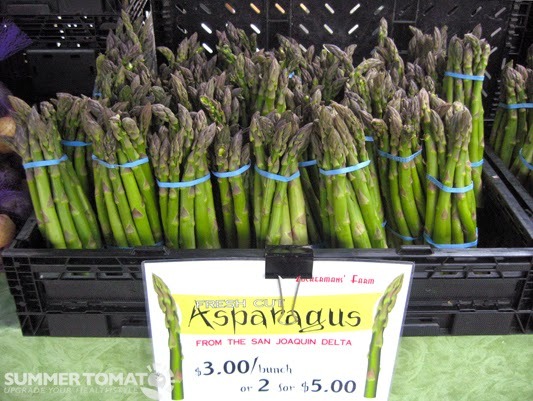 The Gray Report: Drought ends the tastiest asparagus: is Zinfandel next? Roscoe Zuckerman is a fourth-generation family farmer in Stockton. CUESA did a nice slideshow about his operation. You can learn a lot about asparagus from it, including that jumbo asparagus is more tender and extra-thin is more fibrous. Precisely! Both styles of extreme asparagus require plenty of water, so Russ and I might both be out of our favorite soon. 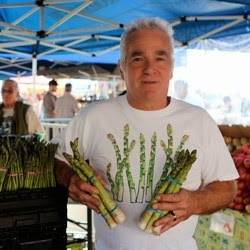 But Russ has a few weeks on me, because extra-thick jumbo asparagus comes from vigorous young plants, and was still in the Alemany farmers' market on Saturday. My favorite extra-thin asparagus, however, is gone for this year at least, and maybe for good: a victim of California's drought. I used to think asparagus was extra-thin because it was picked young, but I was wrong. Turns out extra-thin asparagus is the product of older, less productive plants. Doesn't that sound like old grapevines? Putting their energy into fewer, smaller, more concentrated berries? The Zuckerman staffer at the Alemany market told me that the farm isn't getting enough water for it to give any to its plants that produce extra-thin asparagus. The farm has to triage. The less productive old-vine asparagus has been cut off. One might try to argue that this won't happen to old-vine Zinfandel because its grapes fetch a price premium. Yet so did Zuckerman's extra-thin asparagus: I paid $4 per bunch for it, compared to $3.50 for a larger bunch of ordinary asparagus. That's at least 14% more, not counting the size of the bundles; I'd say the true premium was closer to 30% more. How much, really, is the price premium paid for old-vine Zinfandel? Zinfandel growers were paid on average only $624 a ton in 2014. That's well below the average for all California red wine grapes, which was $892. Moreover, Zinfandel grape prices dropped 4% in 2014 while average red wine grape prices went up 5%. If a farmer has limited water sources, and has to triage something, is it going to be the oldest vines, or the most productive and valuable vines? I wish I had bought several more bundles of Zuckerman's extra thin asparagus when it was there for the taking. I hope we're not saying that a couple years from now about old-vine Zinfandel.